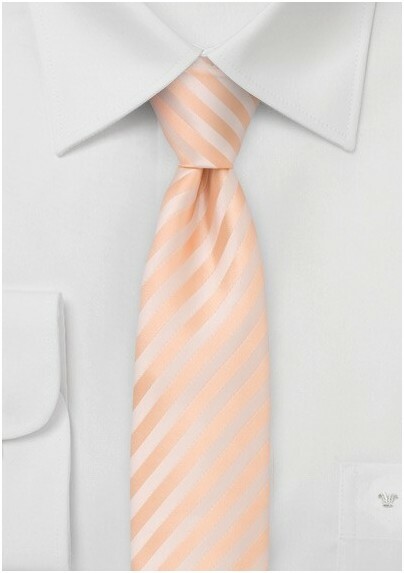 Expect nothing less than the best when you're wearing our gorgeous tie in peach with monochromatic stripes. It's sophistication is supreme for the months of Summer. It's alluring shine adds to the beauty woven delicately into the tie. It will catch whatever light that passes it, causing eyes to be caught on it's charm as well. Wear it with a deep navy summer suit and become the guy you always wanted to be. This incredibly elegant tie comes from our skinny collection. 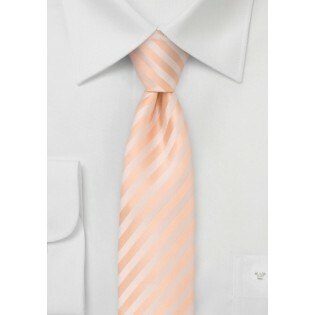 Our Peach Monochromatic Stripe Skinny Necktie width is not the standard 3.0 inches, but 2.25 inches. It's striped design is enticing in it's design. It also comes in a standard width design. Tie Length: 63", Skinny Width: 2.25"